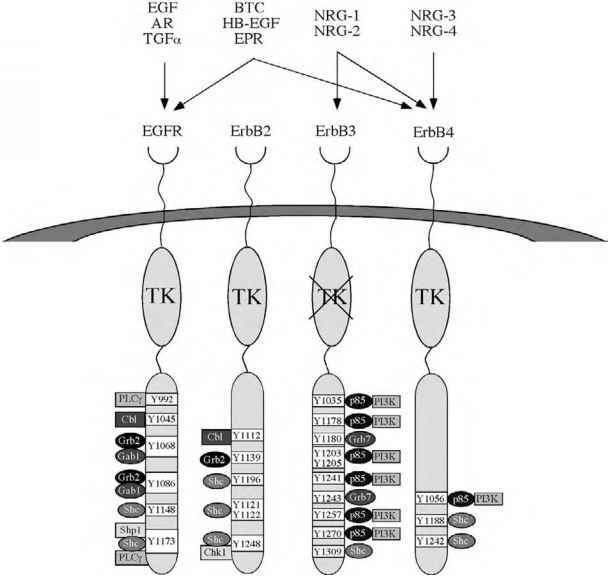 Figure 1 Models of the FGFR signaling complex. Independent binding of FGF to matrix heparan sulfate chains of a membrane-anchored proteoglycan (HSPG) in both orientations confirmed by crystal structures of heparin-FGF complexes is indicated. 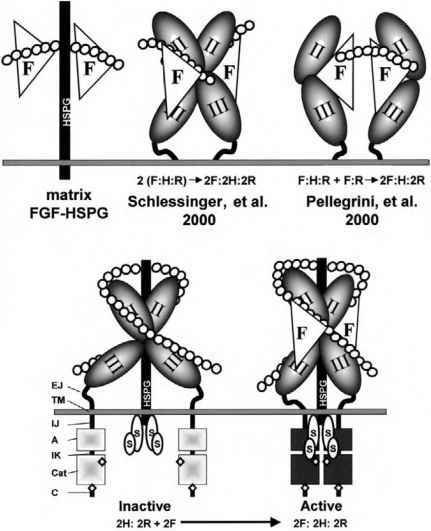 Also shown are the two divergent models of active dimeric complexes of heparin oligosaccharide (H) (open circles), FGFR (R) comprised of Ig modules II and III, and FGF (F), with the order of assembly proposed by the authors. At the bottom, an alternative conformational model in membrane context is depicted. EJ, extracellular juxtamem-brane; TM, transmembrane; A, kinase ATP binding domain; IK, interkinase domain sequence; Cat, kinase catalytic domain; C, C-terminal sequence; S, membrane-anchored FGFR kinase substrates. Functional tyrosine phosphorylation sites are indicated by diamonds. 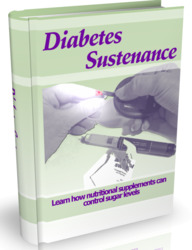 with membrane-bound substrates . C-terminal to the intracellular juxtamembrane domain is the relatively conserved tyrosine kinase sequence domain comprised of adenosine triphosphate (ATP) binding and catalytic subdomains. Within the kinase domain is a kinase repression/derepression regulatory sequence containing two of the three functional tyro-sine autophosphorylation sites [2,8,9]. Extending from the C terminus of the kinase domain is a less-conserved region among the four FGFRs containing a third functional tyro-sine autophosphorylation site. The extracellular domain of the transmembrane FGFR kinase consists of two or three immunoglobulin (Ig)-like modules. Ig module II or III of FGFR independently binds heparin or HS, and, in complex with affinity-selected heparin or HS, independently binds an FGF [2,10,11]. Heparin-module II complexes bind a wider spectrum of FGFs than Ig module Ill-heparin complexes [10,11]. However, only one FGF binds to a monomeric ectodomain composed of Ig modules II and III [3,4,10,12]. Ig modules II and III cooperate both within monomers and across dimers with cellular HS to confer specificity for FGF [2,3,12]. The FGFR forms ligand-independent dimers or higher order oligomers on the cell surface that are dependent on the sequence between Ig modules II and III . A highly conserved sequence domain rich in basic amino acids within the N terminus of Ig module II is required for the interaction with heparin and HS [3,14]. Mutations in this domain significantly affect both heparin and FGF binding and activities of the FGFR complex . N-terminal to Ig module II is an alternatively spliced sequence rich in serines and acidic residues called the acidic box. When present, alternatively spliced Ig module I modifies the affinity for both heparin and FGF . The exon coding for the acidic box sequence is always included whenever Ig module I is present. The acidic box sequence between Ig modules I and II may be a structural requirement as well as a functional element that contributes to reduction of affinity for both HS and FGF by Ig module I [3,15].